The headline figure on investment lending — a fall of 1.6% by value, seasonally adjusted — was mostly explained by lower lending to corporate entities; lending to individuals was only marginally below the mean for the preceding three months. By most other seasonally-adjusted metrics, lending recovered in April. In particular, the total number of loans for owner-occupation, the subtotal excluding refinancing, and the number for acquisition of established homes for owner-occupation, all set 10-year lows in March but bounced back in April (ABS 5609.0, Table 1). The rise in lending in April contrasts with bleak news on construction and retailing. 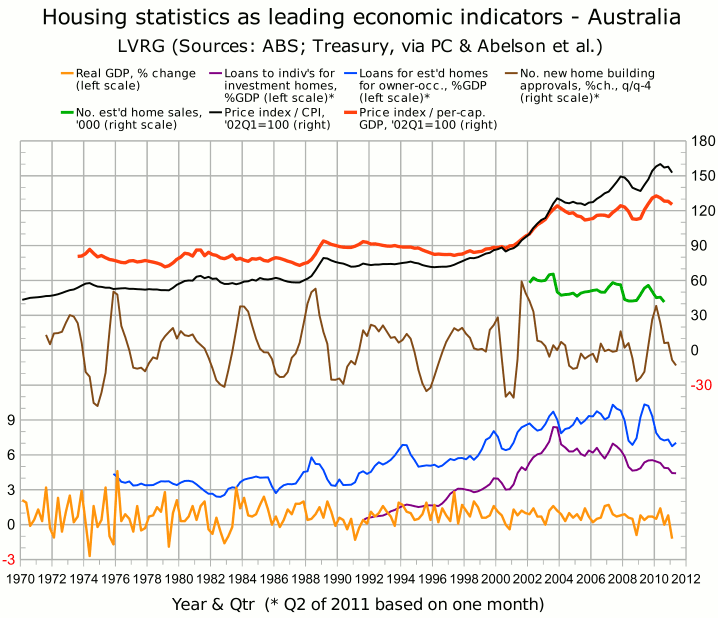 As the Murdoch press reported yesterday, “Australia's construction industry has shrunk for the 12th consecutive month... All four sub-sectors contracted in May, with a significant fall in apartment building... [T]he apartment sub-sector has recorded 13 months in a row in negative territory.” Meanwhile the retail industry, squeezed by high household debt and falling asset values, is headed for its lowest year-on-year growth for 20 years. In any case, the volatility of monthly statistics is one reason why the figures in the above graph are aggregated quarterly even if they are available monthly. One-off influences on the April lending figures should be diluted or compensated as later figures are added to the aggregates for the second quarter.